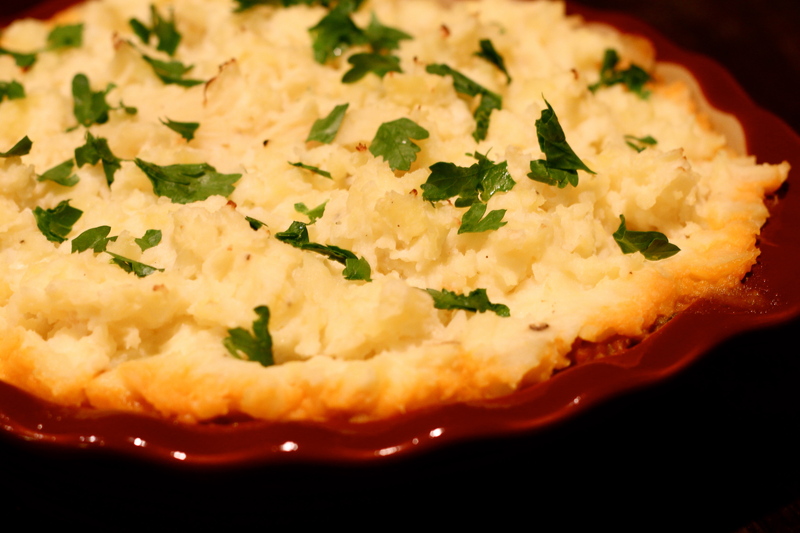 On a cold night there is nothing better than a warm hearty dish and since St. Patrick’s day is just around the corner I decided to be adventurous and make Cottage Pie. Cottage pie is also known as Shepard’s pie, it is a traditional UK dish that usually consists of a base made from beef, lamb, or mutton and topped with mashed potatoes. How can you go wrong with this dish?! I decided to put my own twist on this classic by using ground turkey (fewer calories and less fat than beef or mutton) and added deliciously sweet parsnips and horseradish cream to my mashed potatoes. PURE HEAVEN! Parsnips are a root vegetable (a relative of the carrot) and are jammed packed with vitamins, minerals, potassium, and fiber! The result was a warm deliciously satisfying dish that my ancestors would be proud of. 🙂 Enjoy! Prepare pie dish with non-stick cooking spray. Place bay leaf and a pinch of salt into a large pot of water, once water is boiling place potatoes and parsnips in pot then bring to a boil again. Boil until potatoes and parsnips can be pierced with a knife (usually 15 to 20 minutes) then drain. Drizzle 2 Tb. of vegetable oil in the bottom of a deep dish saute pan then place ground turkey in. Use a wooden spoon to break up the turkey periodically. Make sure to stir turkey around to brown completely, this takes about 8-10 minutes. Add onions and carrots to turkey and cook for 2-5 minutes. Add tomato paste, fresh thyme, flour, garlic powder, salt, pepper, chicken stock, and peas to turkey, cook for 10-15 minutes, stirring periodically. Once potatoes and parsnips are drained smash in the pot used for boiling and add sour cream, horseradish cream, buttermilk, and butter. Add salt and pepper to taste. Bake for 20 minutes, then allow to sit for 5-10 minutes before serving.